You are currently browsing the tag archive for the ‘Batman: Gotham Knights Online’ tag. enjoyment of comic books? The questions abound! entire arc. We’ll judge it against the best Joker stories or yore! coming out. Danny will play Mahjong on his iPad. Returns was just released. Does it hold up? We discuss the Hurrwitz/Finch Scarecrow story arc in Batman: The Dark Knight. The TPB will be dropping July 2013. Should you buy it? Both Danny and Dustin to stump everyone with a Batman trivia game! Topic 3- Our favorite Joker stories! we’re going to discuss some of our favorite Joker story lines of all time! This week Garrey, Danny and Dustin talk about Dustin’s trip to Batman LIVE and we also talk The Dark Knight Returns Part 1 we then go to our October news coverage of Comic news, Media and Merch as well as our comic reviews for all the Bat-tiles for the month. Side note: During the recording process I had my cell phone sitting close to my microphone and that caused some static interference and I do want to apologize for that. Won’t happen again! 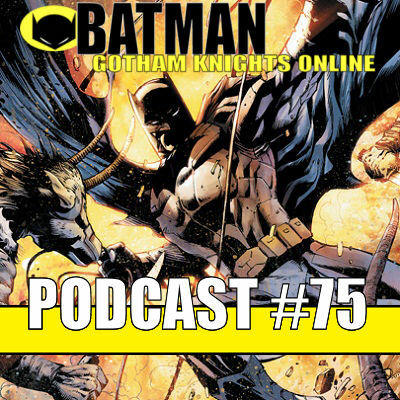 This week Garrey, Danny and Dustin had the great opportunity to talk to current writer forBatman: The Dark Knight the very talented Gregg Hurwitz. Also in this episode we go over all Bat-News and updates as well as reviewing all the comics for the month of August. Thanks to Gregg Hurwitz for taking the time out of his busy schedule to speak with us. We’re back! Apologies for the delay folks! But this week Danny makes his triamphant return along with the usual suspects: Dustin, Paul and Garrey This episode we will discuss all the Bat-news for the month of July. Also in this episode Garrey and Cory talk about Gen Con 2012 which Cory attended this year! After a couple of announcements at the end of the show we say our goodbye to co-host Paul as this being his final episode with us for the forseeable future. So sit back… relax and enjoy the show!